I'm Shelf-ish: Hearts Beneath the Badge Book Excerpt Tour - Excerpt #16 - Win $50 Amazon Gift Card! Hearts Beneath the Badge Book Excerpt Tour - Excerpt #16 - Win $50 Amazon Gift Card! We are thrilled to be hosting Karen Solomon and her Hearts Beneath the Badge Book Excerpt Tour today! I'm Shelf-ish kicks off excerpt #16 and if you follow her tour here, you could win a $50 Amazon Gift Card! All you have to do is fill out the Rafflecopter form below and leave comments on each of her stops for extra entries. Good luck! Hearts Beneath the Badge is a unique compilation of interviews with officers across the country. It's not about the crimes they witness or the judgment they face; it's about them - Damien, Danny, Frances, Ken, Pamela, Brian, and more. Their thoughts, their fears, their proud moments and their heartbreak. It's about the people we often don't see because we are blinded by the uniform. Hearts Beneath the Badge is a book about the good deeds officers perform. There is a pressing need for people to see more than just the officer's hearts; they need to see their souls. Society as a whole needs to accept police officers for who they are - mere mortals. In order to do that, they must look through the layers of the officer's lives and see the heartache and joy, the same heartaches and joy we all experience. Society also needs to know that, whether we want to admit it or not, there is a price to be paid for pursing the love of the law. 90% of all sales will be donated to National Law Enforcement Memorial Fund, Safe Call Now, Concerns of Police Survivors (C.O.P.S.) and PoliceWives. Hearts Beneath the Badge is available at Amazon. Brian knows he can’t learn everything about everyone, that he can’t save the world. If someone is in need of assistance, Brian is the first one to make sure they get to the right agency. But when it comes time to take down a drug dealer or stop a burglary, Brian is the first one through the door. “I’m not the tooth fairy, but I am able to separate the two. Today’s police officers have to be everything, and that’s a hard thing to do.” He believes the police officer of the future needs to be able to balance helping the good while taking down the bad. It’s a fine line to walk with high expectations. Brian also knows that a little goodwill goes a long way. Cops can’t work alone. They need the help and support of the community around them. If there comes a time when Brian needs a little information, one of the people he has connected with will be more likely to provide it. The next officer may find himself, or herself, having an easier time because they see the people in uniform as people with feelings. And, if a time ever comes when Brian is in mortal danger, away from the mainstream crowds, he will be more likely to find an ally willing to get help and offer him comfort. He won’t lie alone on the cold, hard ground because he wouldn’t let someone else lie there either. “Matthew 25:40 says, ‘The King will reply, I tell you the truth, whatever you did for one of the least of these brothers of mine, you did for Me.” That is how I try to live my life, policeman or not,” said Brian. As for his family, they are proud of him. He and his wife have been together for 30 years, and it hasn’t always been easy. “In this job there’s no sleep; you work at night, are expected to be in court during the day, and sometimes you need to find a second job to make ends meet. It’s incredibly stressful,” he said. Although his wife is very supportive, they’ve had some rough patches, in large part due to the demands placed on him and his family because of his job. And Brian isn’t the only one in the family who is in law enforcement. His wife and daughters are as well, they aren’t employed by any law enforcement department; they are in the business because they are Brian’s wife and daughters. Although they haven’t chosen this life, they accept the risks, challenges, and stigmas that come with Brian’s job. It’s just the way it is. One can’t just take off the uniform; it becomes a second skin and it’s with you wherever you go. The people closest to you will become partners in your job, or they will become victims of the stress it causes. Brian’s wife and children have become his partners; they stand with him wherever he goes. Karen Solomon is interested in the feelings of law enforcement and whether or not they have someone that will listen to them, most of them do not. Most books on the market are written by the police officers themselves, in almost textbook fashion relating protocol and situations with the orderliness of a police report. Her books are different from every book out there because the officers bare themselves to her; many of the interviews end in tears because they have opened up something that is very difficult to close. 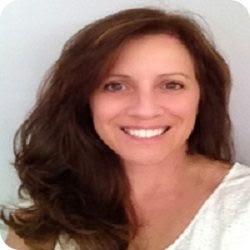 Karen Solomon is a graduate of Eckerd College and blogs as The Missing Niche. Her writing has been featured on PoliceMag.com and To Write Love on Her Arms. She lives in New England with her husband, 2 children and 2 dogs. Proceeds of her latest book, Hearts Beneath the Badge, will be donated to law enforcement charities. Listen to Karen on The Author Show. 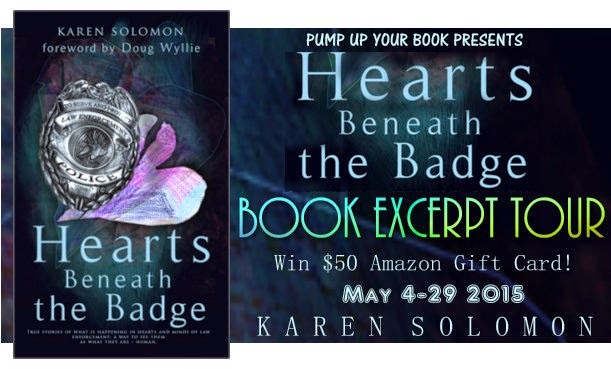 Karen Solomon is giving away a $50 Amazon Gift Card! Leave a comment on all the book excerpt blog stops and win 5 extra entries each time!